Many workplaces expect their employees to do the Office Cleaning or at least tidy their own work area in order to make it easier for a hired office cleaner to do their job later on. Every business that serves cold drinks will have an ice maker either behind the bar, in the kitchen or in a stockroom. These machines require regular maintenance in order to prevent heavy build-up of lime deposits, which can damage them and cause floods. 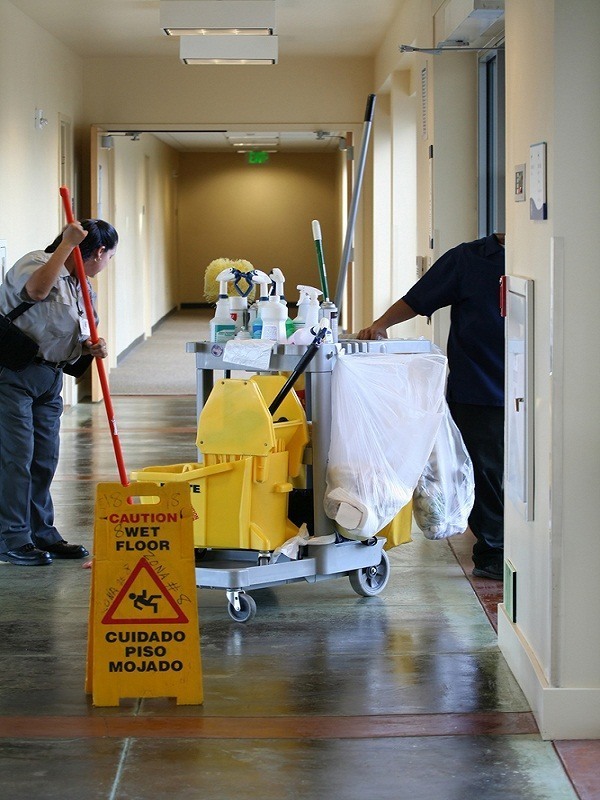 The removal of lime deposits can be very difficult and time-consuming; so many employees tend to leave it out of their daily Office Cleaning procedure until a deep cleaning session is called for; typically prior to a visit from a regional manager. Most business establishments would have a cleaning product specifically designed for removing lime deposits, but a cheaper solution is to use full strength white vinegar. Empty out the dispensed ice so that the interior is ready to clean at a later stage. Completely soak a cloth in white vinegar. Wipe down the entire exterior of the ice maker. The acidity of the white vinegar will slowly eat away the lime deposits. If the layers are quite heavy you can let the white vinegar work for a few minutes before wiping it off. Now soak a fresh cloth in white vinegar and wipe the inside of the ice maker. Rinse with hot water and dry thoroughly. While you don’t have to include this task in your daily Office Cleaning routine, it is good practice to wipe the ice maker down at least once a week in order to stay on top of the lime deposits. Thank you for this excellent tip. We have a client who has a canteen that we clean daily and have tried this method. It actually works very well and white vinegar is also a much more environmentally friendly solution that using chemicals. Really good advice, I shall try the white vinegar on our ice dispenser.